These guys have just about got it right on this one! For the last several years, Christian Vander has been following the spirit of John Coltrane, particularly the Impulse years, Both he and Goubert have been releasing albums of jazz that have improved successively. 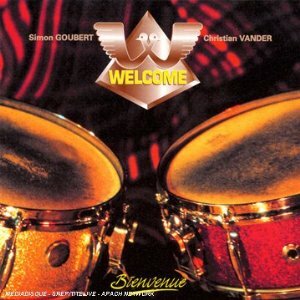 Welcome is by far the best of all of these efforts, a jazz album worthy of inclusion in any collection. This is very much in the vein of Coltrane circa Ascension although the free parts are kept to a minimum on Welcome. When they do show up they seem to be quite effective. There are four tracks, three of them nice and lengthy (including another long version of "Dear Mac" also on the Jour Après Jour album), with a diversity particular to jazz including upbeat tracks, ballad sections, and of course drum solos. What makes this so good is obviously a combination of experience and inner fire; you have to be good musicians to even fake this style. Vander/Goubert's almost double quartet ensemble is tight and spirited and does the job more than adequately. This is one that keeps finding its way back to the player, I recommend it highly to jazz/Coltrane fans.